One of Chicago's nearly 400 red light cameras stands watch at Damen Ave and Division Street in Wicker Park. 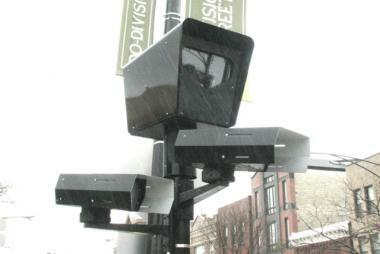 CHICAGO — Could red light cameras be used to give out parking tickets, too? The City of Chicago, while searching for a new vendor to operate its controversial Red Light Camera program, is asking bidders for ideas on how else to use the cameras, including spotting parking violators. The city insists it's just asking at this point and has no plans to use the red light cameras to ticket drivers for anything other than running red lights. But one critic said the aggressiveness of the city's camera enforcement "makes my hair stand on end." “Chicago has to be the most predatory camera city in the country,” said James Walker, executive director of the National Motorists Association Foundation. “I would think they’re looking at it to see if it is possible — they’d like to know from camera companies if you can do it. What makes my hair stand on end is the sheer aggressiveness of their camera enforcement,” Walker said. The city recently released a request for proposal for a new red light camera vendor. Amid the program overview, bidding guidelines, legal requirements and exhibits, the request for proposal asks potential vendors to include ideas on how their camera technology could be adapted to do double duty for spotting parking and other traffic violations. "The Respondent should indicate if and how the proposed automated Red-Light enforcement system could also provide other automated enforcement of other traffic or parking violations such as rush hour restrictions, maximum parking time, exclusive lane violations," according to the request for proposal. The document does note: "The City does not currently intend to implement automated enforcement of these services." Bill McCaffrey, spokesman for the city's Department of Procurement Services, brushed off the idea that the red light cameras will be asked to do more. "As stated in section 2-11, we do not intend to use the red light cameras to enforce any other violations," McCaffrey said. "The RFP process is a great opportunity to gain a wider understanding of available technology in a rapidly advancing field." But it was traffic data gained from using the city's own red light cameras to document speeding incidents that helped persuade city officials that speed camera enforcement could have a place on Chicago streets. That speed camera enforcement program is coming soon. New technology in red light and speed cameras has the ability to see hundreds of feet down streets and sometimes in all directions. Experts have said if cameras can catch the license plate of a vehicle speeding or running a red light, it can certainly identify a car parked illegally in a tow zone, at a bus stop or in violation of Chicago's winter parking ban. Walker, whose nonprofit group is opposed to the use of automated enforcement camera technology on motorists, said adding this type of enhanced enforcement ability to red light cameras is feasible. Chicago's red light camera program has generated $375 million for the city since its start 10 years ago. Walker said preserving the tens of millions of dollars the city receives from Red Light Camera fines every year is the driving force behind the city’s interest. Walker said he believes Chicago is just hedging its bets by having another possible revenue stream in case traditional red light camera revenue takes a hit, pointing to a freshly introduced bill in Springfield. The “One Second For Safety” bill sponsored by state Sen. Dan Duffy (R-Lake Barrington), would force municipalities to add one second to the yellow light intervals at traffic intersections equipped with red light cameras. Studies seem to show adding more time to the yellow light allows more drivers to legally and safely make it through an intersection. In other states and cities where the practice has been used, red light running fell significantly, and safety improved. As a result, red light camera revenue declined. When Duffy proposed the bill last year, lobbyists for the City of Chicago actively opposed the bill. University of Illinois Chicago professor Rajiv Shah, who studies the role of cameras and surveillance in society, finds this potential expanded use of camera enforcement part of the natural progression of the technology. Shah also foresees Chicago integrating its red light cameras into the city’s already robust network of surveillance cameras administered by the Office of Emergency Management and Communication and allowing the city's 384 cameras to serve as a means to track vehicles in real time. Identifying uninsured vehicles and issuing fines via the city’s Red Light Camera system was an idea proposed by Ald. Ed Burke in 2009. But the latest request for proposal seems to reveal some other potential issues or challenges for the city and a new red light camera vendor. Due to the recent bribery scandal, current red light camera vendor Redflex Traffic Systems which has held the contract since the program’s inception in 2003, may continue to haunt the city. That’s because, unlike most city Red Light Camera programs where the vendor provides the cameras for free or leases the cameras monthly, Chicago purchased their cameras from Redflex outright. This was considered forward thinking on the part of the city, as typically when the camera companies provide the hardware to a municipality for free, they take an often significant cut of the ticket revenue. Chicago does not currently share revenue generated by fines with Redflex, but pays on a fee-based schedule. Chicago spent tens of millions of dollars to buy its 384 red light cameras and associated hardware. While the city licenses software from Redflex to operate the cameras, there are propriety restrictions that may make it difficult at best, and impossible at worst, for a new vendor to utilize the current camera infrastructure long-term. Some camera companies do not use the same in-ground sensors which trigger Redflex's cameras. Several companies utilize laser technology or video to sense when a vehicle has run a red light. The city all but admits it may have to replace its current cameras as it asks vendors to submit two proposals — one where the city owns the cameras and another where the vendor retains ownership of the hardware. "As is best practice, we are exploring all options before deciding on a new vendor to ensure we obtain the best deal for taxpayers and residents," said McCaffrey. Barnet Fagel, a traffic safety expert, forensic video specialist and longtime critic of Chicago's Red Light camera program, said another vendor could utilize Redflex cameras and hardware. "Yes, absolutely," Fagel said. "Because a video camera is a video camera — a sensor is a sensor." The current Red Light Camera contract expires on July 31. Camera companies have until April 16 to submit bids to win a five-year contract to be the city's new red light camera vendor.